Martech Today defines a Data Management Platform (DMP) as “a central location for marketers to access and manage data like mobile identifiers and cookie IDs to create targeting segments for their digital advertising campaigns.” DMPs are designed to improve ad targeting by leveraging insights collected through the use of anonymous cookies and amplified by lookalike models. A Customer Data Platform (CDP) ingests all enterprise data sources and types (e.g., first-, second- or third-party data, structured, semistructured, unstructured, social media, websites, transactional databases, customer relationship management systems) to provide a single, 360-degree view of the customer and continuously and automatically update as new data becomes available. Simply said, CDP’s provide marketers with a single platform from which to collect, manage, transform, and activate their customer data, regardless of the source. 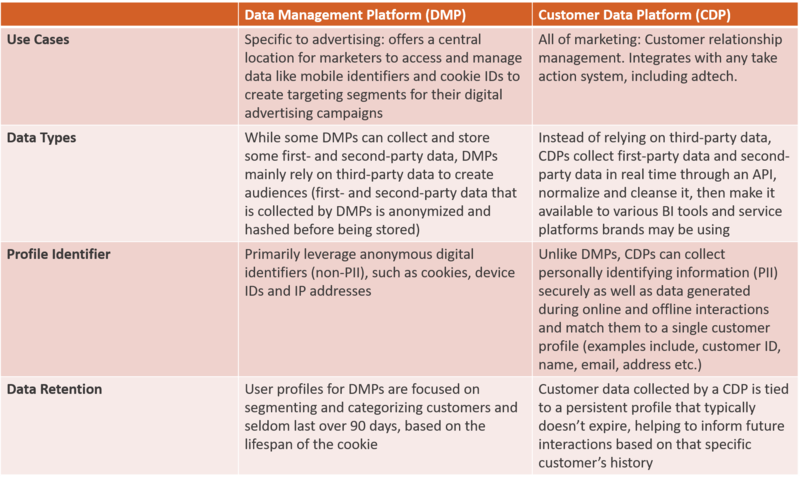 Let’s break down DMPs and CDPs with a side-by-side comparison. DMPs work primarily with 2nd and 3rd party data comprised of anonymous non-PII such as cookies, devices, IP addresses. Anonymity is essential to the DMP’s role as a way to exchange information about audiences and therefore are heavily reliant on probabilistic identifiers and unable to perform advanced identity matching. The reality is, anonymous third and second-party data becomes less valuable to marketers with each passing day; partially due to consumer backlash and regulation and partially due to the prevalence of ad blockers and cookie rejecters. The industry shift towards requiring opt-ins rather than opt-outs is a perfect example of the diminishing scale and value of this kind of data. Unlike DMPs, CDPs can collect PII securely and match them to a single customer profile. The unification of each customer’s profile across all channels and sessions provides a more cohesive picture and allows marketers to build a coherent omnichannel experience. Audiences created in a CDP are highly customizable, allowing marketers to hone in on the customers they need to target in just a few clicks. With a CDP marketers have the ability to define custom audiences and criteria to apply to them, without having to stick to the rigid, pre-defined audience types of a DMP. Not only can a CDP track both anonymous and known interactions across all interaction channels (such as call centers, POS systems, etc) and identify customers and devices, but it can also feed data to fulfillment systems, websites, call centers, ad networks, and even DMP’s to support further segmentation, and campaign management. Customer profiles in a CDP are stored persistently because the data does not expire, these profiles can continue to evolve and become more robust as customers interact with a brand across different channels. Because DMP’s rely on the cookie for data collection, a DMP profile will typically last 90 days before expiring (sometimes shorter, sometimes longer). This blog was written and contributed by Ilona Lemeshov, Director of Managed Services at QuickPivot.